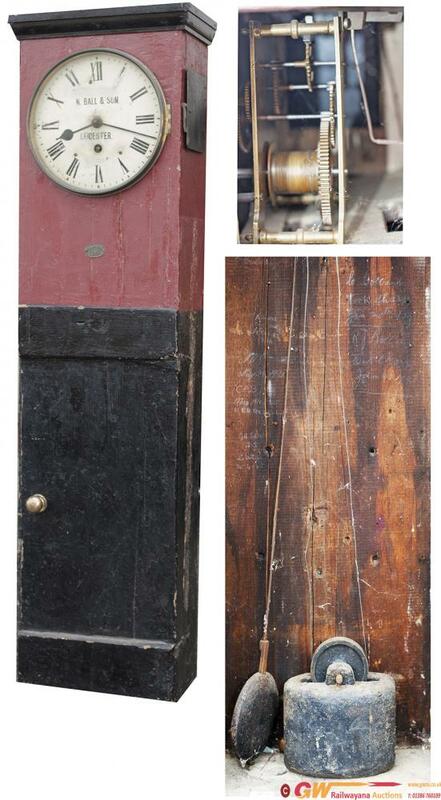 Midland Railway 10 inch pine cased weight driven railway clock supplied and manufactured by Reuben Bosworth of Nottingham. The early weight driven movement has A shaped plates with cut out to the bottom, which are held together by turned pillars with a central ring, these features date it around 1860. The original dial has been rewritten by N. Ball & Son of Leicester who took over the service and maintenance of clocks in the Nottingham & Leicester areas but Bosworth is clearly visible as ghosted writing. The case is of rectangular design manufactured from pine and has a bottom door and two side access doors, the case would have been originally been combed with paint to look like Oak but was repainted in LMS maroon and black probably in the 1930's the LMS brass oval numberplate 12028 is affixed to the front, inside the case are various dates and signatures of the signalmen who worked in the signal box, these early weight driven clocks were used in signal boxes where accurate time keeping was important. Reuben Bosworth is recorded as working in Upper Parliament Street Nottingham between 1808 and 1877 and was an early supplier to the Midland Railway. In working condition complete with weight pendulum and key.